Another single game day, thankfully too, i had to blog abt the yesterday’s one too, so bit less work to do… What to do yaar, Month end works catching up…. Another close game, thanks to Warner and Hopes, Delhi looked like they got some kind of curse, they can’t even win now in their home pitches. With Hopes getting his fifty Delhi lurked beyond 160, with late lusty blows from 1.9Mn Irfan. Gayle and Kohli looked to finish the game and get ready for the party as they went abt 10 to 12 runs per over. Few poor shot, excellent fielding all seems to have pulled back the game for Delhi, but it wasn’t so, as Skipper Vettori and Syed got RCB past the winning run with 3 wickets in hand, Which delighted the owner Sid Mallya who shared with his lady love Deepika Padukone with a gapless HUG…. – Dilshan became the second player after Gomez (KTK) to get second duck in IPL 4. – James Hopes became the first batsmen to be out in a NO-Ball which was referred to third umpire in IPL, and eventually getting the reprieve, Abimanyu Mithun was in the receiving end. Sachin came close for this instance in the last game but some controversy got him back to pavilion. 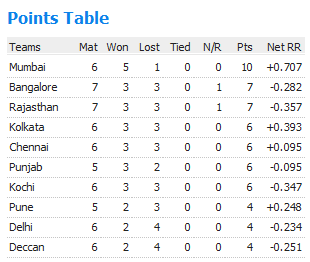 – 18 extras given by Bangalore is the second highest in the season, table was topped by Rajasthan with 19 extras vs Kolkata. – Virat Kohli becomes the sixth batsmen to join the 200 runs club, now he is with 227. – Virat Kohli with his 4th IPL fifty went past Rahul Dravid’s 1132 runs to become the second top scorer for RCB. 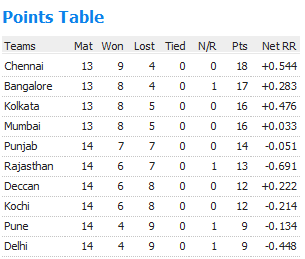 Now Kohli is with 1137 runs, still the RCB most run scorer is Now KKR’s Kallis with 1271 runs.